Naturesorb is a natural environmentally friendly peat moss absorbent that meets all of your Petroleum, Oil and lubricant spill needs. 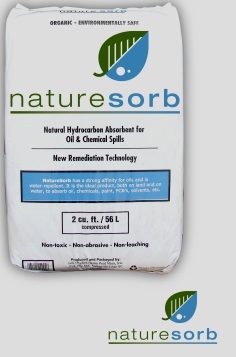 Naturesorb quickly and effectively absorbs, hydrocarbons, eliminates leachate causing secondary spills, and provides a solid matrix that can be disposed of in a cost-effective and environmentally responsible manner. 2 - 25 LB. bails of Naturesorb is all you need to clean up a 50 gallon spill compared to 30 - 50 LB. bags of clay to clean up the same 50 gallon spill resulting in big savings in labor and materials. Sold in 3 LB. zip lock bag, 8 LB. bag, or 25 lb. bale. Contact Wale Environmental for any additional questions or information.